Mark and I would like to thank the families that have been affected by ALS who have been so kind and generous in helping us through our ALS journey. We would like to thank the Nehra family for their continued support to the ALS Association. Virn Nehra’s dad suffered with ALS for nearly 30 years. For many years Virn has organized a golf outing in his dad’s honor. The proceeds go to helping other families who are affected by ALS. 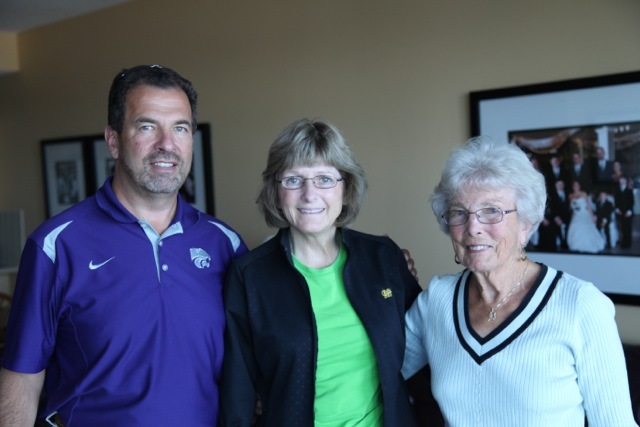 Virn and his mother, Barbara, visited Mark and I last summer to share their journey. One of the best pieces of advice Mrs. Nehra gave us was to travel or do whatever we wanted to do and to not be afraid. You never know when you will find an angel at a rest stop to help you out. We would also like to thank Ruth Pascoe, the wife of Don, who suffered with ALS from August of 2010 to June of 2012. Ruth gifted us with an amazing machine called a DynaVox, which is a speech generating device that helps me communicate by speaking the words that I type into it. Ruth and Don’s sister, Peggy Flora, even took the time to meet with our siblings to share the story of Don’s ALS journey. It was very helpful to our brothers and sisters to know what to expect as I progress with ALS. The last family we would like to thank is my mom’s childhood friend Jean Holmberg’s family. Jean’s daughter Ann suffers from ALS and Mark spoke with Ann’s husband Bill and he provided some great advice from his experience in caring for Ann. Thank you, all of you. We love you. Our family has lost 8 people young and older to ALS. The only difference is most of them didn’t live much longer than a year or less. Such a sad disease, I think the most awful of all of them. Best wishes to all, stay strong!! What a nice and thoughtful post. Barb (and Turk) Nehra have lived 3 houses down from my parents for 30 years. We have always called her Grandma Barb. I loved reading about all this love and support from other ALS families. Also, meant to post on your last blog what an inspiration you both are with all your recent travels. How sweet to share the gift of communication. You are blessed to have such caring people helping you on your journey. I think the travel advice is the best! Getting tips from others who have walked the journey makes your journey a tiny bit easier and gives you needed tips and advice. God Bless you and the others who are or have suffered from this disease.